I had a lovely day at Andover yesterday despite a not so great start on my part. I was Pen Stewarding which is always a worthwhile experience and gets you to look at hamsters in a more subjective way. Admittedly before the show began I was a little bit "oh that's a cute hamster" (more on that in due course) but as time went on it got easier to see things differently. James was one of six in his straight class and placed Second. He'd dropped a few points since Dawlish but there's still time for him to improve. 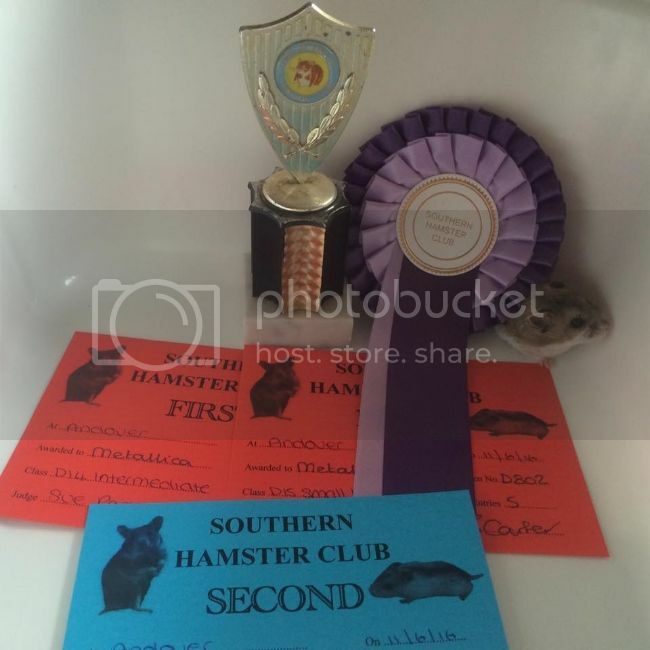 We also came away with two first placings in Intermediate and Small Hamstery. Well done Fluffagrams and James. Sorry I couldn't meet your little star in person but I couldn't make Andover this year. Love your new girl Victoria. Another star in the making! Congratulations! Lovely wins James looks very proud there! My little ones are in a bit of a lull as the show stalwarts are getting past their prime and the youngsters aren't there yet. We still managed to achieve some 3rd and 4th placings though with old hands Lil, Nin, Georgic and Delphic. The youngsters didn't place this time. I picked up three planned newbies at this show. The two Syrians are adults from Hurtle Hams. Sue, the LH dark grey girl, is going to meet one of my dark grey carrier boys when she's settled in. Hippo will have to wait until my Tydry girls are old enough, as he's a yellow dom spot carrying cinnamon. Jessie had to stay at home. At the moment she's just too crazy to be sit nicely for the judges but we are making progress with her. She's also got a skin split on her neck (something that can happen with Chineseys) so she wouldn't have been able to have been shown anyway. She made sure she got lots of attention when I got home though and was adequately spoilt. She's still fairly young so I'm hoping that she might be up to a show in the future. I kinda wish I'd have made the rosette holder a little bit bigger. I've only got three on there and there doesn't seem to be much room. James says thank you for all your messages of congratulations. He had a nice relaxing day yesterday alternating between napping, sitting in his hammock and digging. Your newbies look adorable Vectis and well done to your old hands for their placings.